13 year old is the first step of the teen phase and is a time to have a fresh and cool hairstyle. For a new teenage boy, it’s best to have a short haircut that does not only look charming but also easy to maintain. But while adopting a new hairstyle it is necessary to consider his personality and mood. Boys aged between 10 years old and 13 years old can get quite similar haircuts and hairstyles. Let’s see how can they look awesome with the trendy haircuts in 2019. There are endless hairstyle options for 10, 11, 12 and 13 years old boys for all types of hair such as curly, straight, long, short, wavy etc. and we’ve gathered 10 best among these that will make you go ‘wow’. At the present time, not only the girls concern with the hairstyle but boys also want to try various hairstyle to have a dashing look. Depending on the hair type and the face shape, haircuts vary a lot. Like the adults, teenagers also like to have a new hairstyle for a new appearance that can make them feel more confident. Here are some cool ideas for 13 year old boy haircuts to stand out from the crowd. You can also check these 10 years old boy haircuts. When you want to have a haircut that goes with almost all styles and looks, Comb over fade is the one to opt for. Not only is it trendy and classy, but also versatile enough to make you look stylish for every occasion. With longer hair on top, this style features low or mid faded hair on sides. The top hair is then combed as a side part or textured style. You can cut the sides as much short as you want. This haircut has been a popular choice for boys since years and it’s not fading away soon. 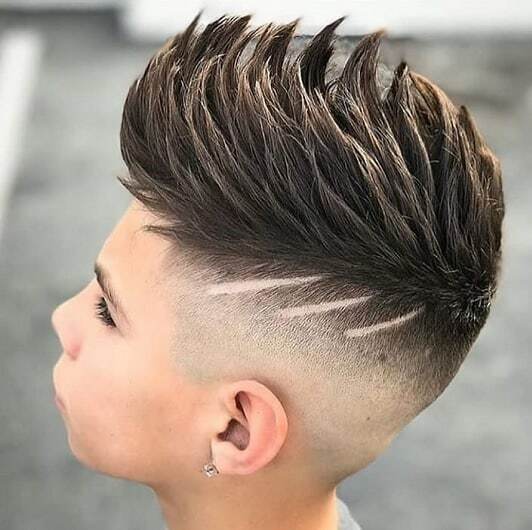 If you’re looking for a perfect 13 year old boy hairstyle for wavy hair, there can be no better option than taper fade cut. With short hair on the sides, the hair on the top is left of medium length. A textured crop on the top and blur on the way down is the perfect fade cut. No matter if you want to have a classic or modern look, this is a flattering choice for either reason. You can make it bold or clean cut according to your choice. Simply do a side part and leave the top hair a little long. Style it loosely with texture and get ready in no time. This timeless haircut is one of the easiest and least time-consuming short hairstyles for boys. This haircut is a fun way of creating a unique and attractive hairstyle. All the skilled barbers around the world show their skills while they make the pattern on the sides and this helps a new design to pop up every now and then. These designs can be as simple and as creative as you want them to be. Either keep it simple with sidelines or make it attractive by opting for creative patterns. Often referred to as Mohican, Mohawk haircut is a very unique and stylish cut. Here, both the sides are clean shaved and just a strip of hair is left on the top. The middle strip has noticeably longer hair. This 13 year old boy haircut often demands high maintenance and care. If you want to describe yourself with an edgy look, this is the perfect option for you. This section includes all the haircuts which are highly versatile and available in a wide range of options to choose from. As the name suggests, hair on the sides is cut short while the top hair is left noticeably longer than that of sides. You can fashion the top hair into a wide array of several layers, textures, styles and colors depending on your facial shape. This is a new inclusion in the hairstyle trends of boys. Ironically, it is derived from the retro era of the fifties. This haircut for 13 year old boy takes style to a whole new level. Here also exists the concept of the short side and long top but here the hair on the top is left very long. When side-parted, the top hair can reach up to the chin or even go beyond the chin. Wearing a top knot can also be a part of this style. This Hairstyle actually has a history behind it. It came through black men and the high-top hair featured the inclusion of hip-hop into the pop culture. This 13 year old boy hairstyle continues to be in trend for the African-American community. The high Top is made more attractive with curls or dreads. With a little maintenance, you can rock the look with any kind of hair that you have. When you allow fringe to take the center stage, you have an option of a huge range of looks. Get a fringe haircut with a smooth texture. Though it doesn’t suit on every face, you can select one style according to your facial shape and you’re all set! Commonly referred to as Fohawk, this Hairstyle has become highly popular among boys these days. Being classy, trendy and edgy can be the reason. The best part is that this style is acceptable in formal office meetings as well. This versatile hairstyle for 13 year old boys is perfect for hair of any length. It even epitomizes modern masculinity with great style. No matter what 13 year old boy hairstyle you have adopted the most important things is to be confident with it. These above hairstyles are in trend now and are being followed by many teenagers. So, opt for these trendy hairstyles and try something new!